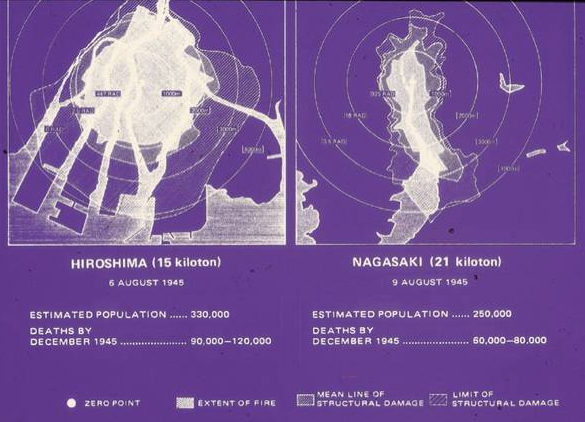 The mortality was greater in Hiroshima because the city was located in a flat delta, in contrast to Nagaski’s Urakami Valley. The Nagasaki-Urakami is enclosed by mountain ridges that shielded the city. Nevertheless, the instant lethal effect revealed consideration of the use of these annhilative weapons in warfare can be tolerated by man now that nukes of far greater destructive power are now available. At no time during the period between 1943 and 1946 were facilities allotted, or time provided, for the Medical Section of the Manhattan Engineer District to prepare a comprehensive history of its activities. Regulations forbade notetaking. Official records were scanty. There were few charts and photographs. Large numbers developed vomiting and bloody and watery diarrhea (vomitus and bloody fecees were found on the floor in many of the aid stations), associated with extreme weakness. They died in the first and second weeks after the bombs were dropped. During this same period deaths from internal injuries and from burns were common. Either the ehat from the fires or infrared radiation from the detonations caused many burns, particularly on bare skin or under dark clothing. After a lull without peak mortality from any special causes, deaths began to occur from purpura, which was often associated with epilation, anemia, and a yellowish coloration of the skin. The so-called bone marrow syndrome, manifested by a low white blood cell count and almost complete absence of the platelets necessary to prevent bleeding,w as probably at its maximum beTween the fourth and sixth weeks after the bombs were dropped.